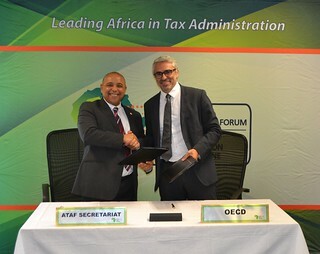 19/06/2018 – Today, the OECD and the African Tax Administration Forum (ATAF) signed a renewal of their Memorandum of Understanding (MoU) until June 2023, agreeing to continue to work together to improve tax systems in Africa. The MoU sets their co-operation towards the achievement of the common objective of promoting fair and efficient tax systems and administrations in Africa. Logan Wort, Executive Secretary of ATAF, stated that, "ATAF has made tremendous strides in its ability to offer concrete and tangible benefits to member administrations. Our targeted technical assistance work in stemming illicit financial flows that erode Africa's tax base in key sectors, has begun to bear fruit and is a key driver in advancing Africa's development Agenda 2063. Our two organisations enjoy a special relationship that has contributed to the sharing of knowledge and the development of better tax policy for Africa and technical skills of African revenue administrators." "It has been a privilege to partner with ATAF over the past nine years,” said Pascal Saint-Amans, Director of the OECD's Centre for Tax Policy and Administration. "Our work with African countries is an essential component which helps us to develop new international tax standards. Domestic resource mobilisation is essential to reach the Sustainable Development Goals. The Addis Ababa Action Agenda also recognised the universal nature of the tax challenges of the 21st century."